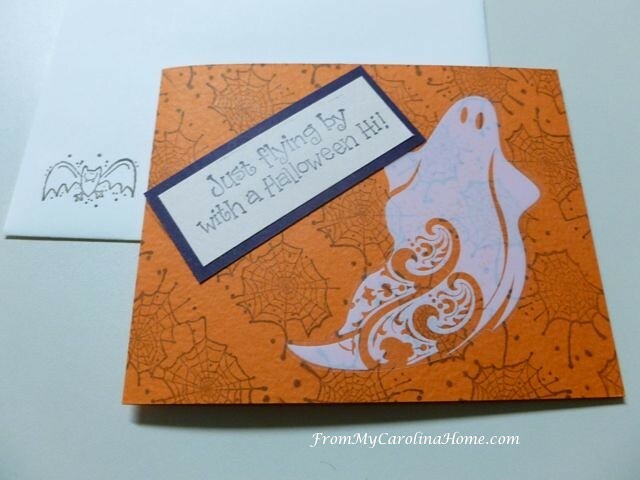 Getting farther into October, it is time to begin stamping cards for Halloween. Autumn Jubilee wouldn’t be complete without some cards! I have so much Halloween fun stuff, thanks to Katie and her generous gift. I wanted to use some of the stickers and elements with the stamps, but I had more ideas than time, LOL!! Anyway, I began with my roller as I haven’t used it in a while. I have several Halloween wheels, and this year used the spider web. 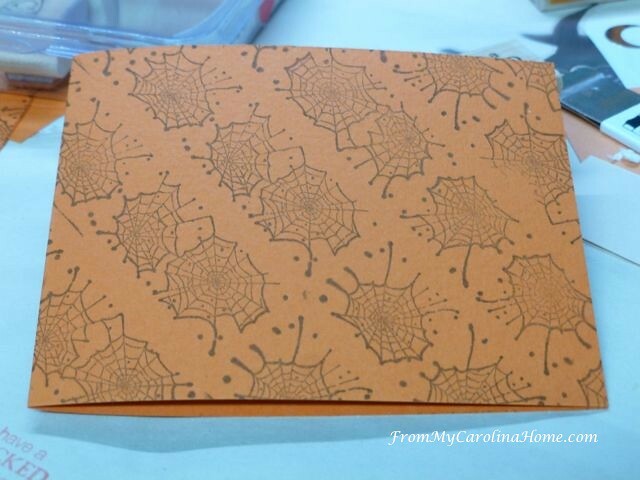 I rolled it on my paper mat first to ink up the roller well, then rolled one line of spider webs on the orange paper, on a diagonal. Then I use my roller guide to get the next lines straight, and rolled the entire front of the card. 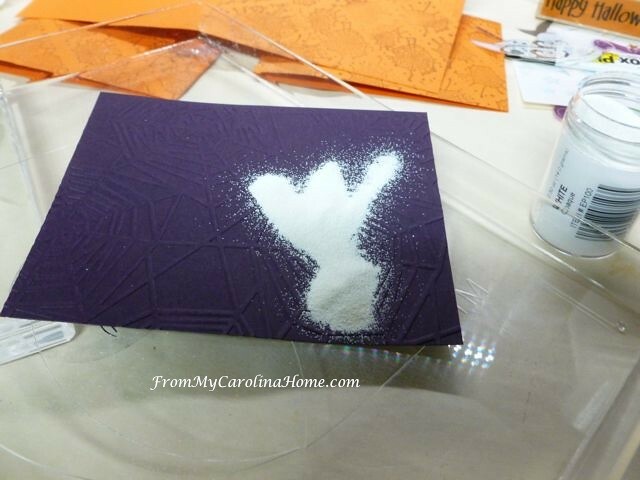 On top, I placed a translucent ghost with some spray adhesive so the glue wouldn’t show through. 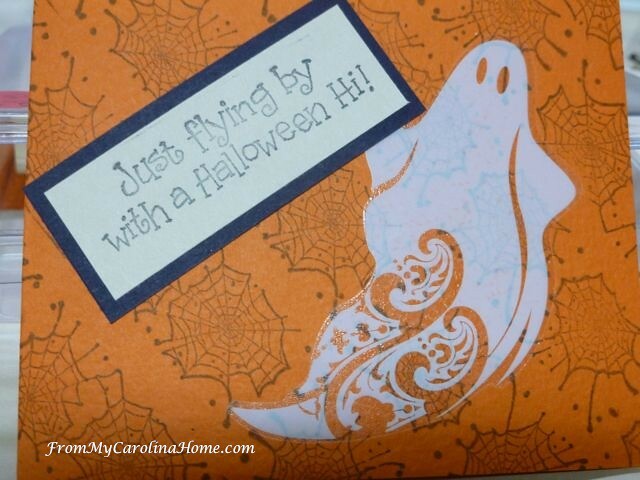 The sentiment ‘just flying by’ from another stamp set went perfectly with the ghost. If you look closely, you can see the spider webs through the ghost. I made several of these at once, and one of them I messed up. The roller missed a section, and I foolishly tried to re-roll over it. But no matter, this is an opportunity to do something different. 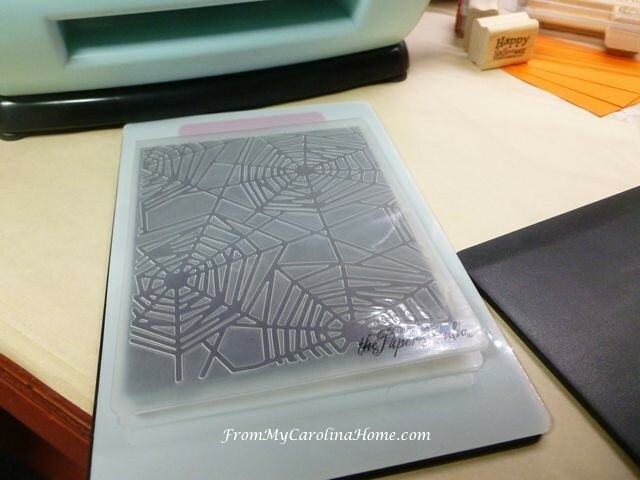 So I got out my Sizzix embossing machine, a spider web embossing folder and black card stock. 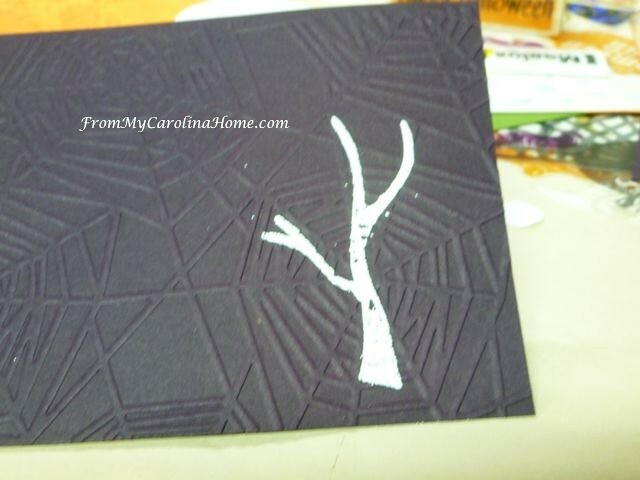 Then, I found the eerie tree with no leaves, and stamped over the embossing with Versamark. 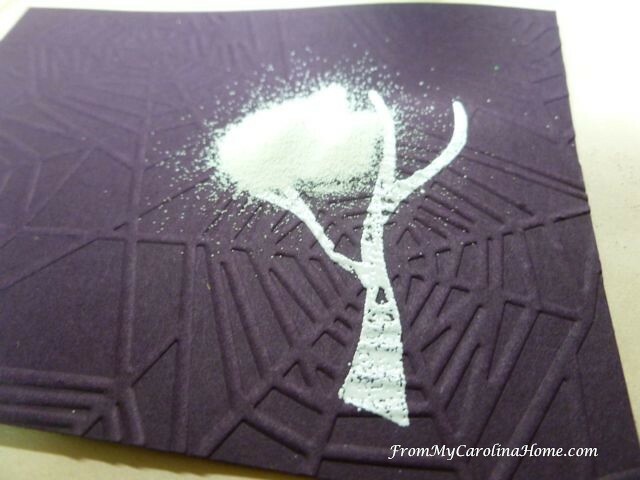 I tamped off the excess, and hit it with the embossing heat gun. Pretty cool!! So, why not add a spooky ghost owl? The bits where the white powder didn’t stick on the tree just adds to the creepy factor. 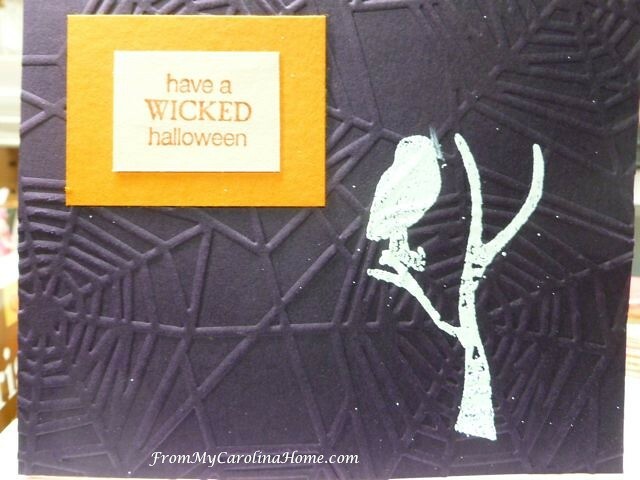 Embossing the owl, and adding the sentiment, completed the front. Both cards have Happy Halloween with a jack-o-lantern face inside. A cute little bat on the envelopes, and my signature stamp on the backs, and they are ready to mail. All done for this year’s designs, at least for now. This one from last year is still my favorite card. 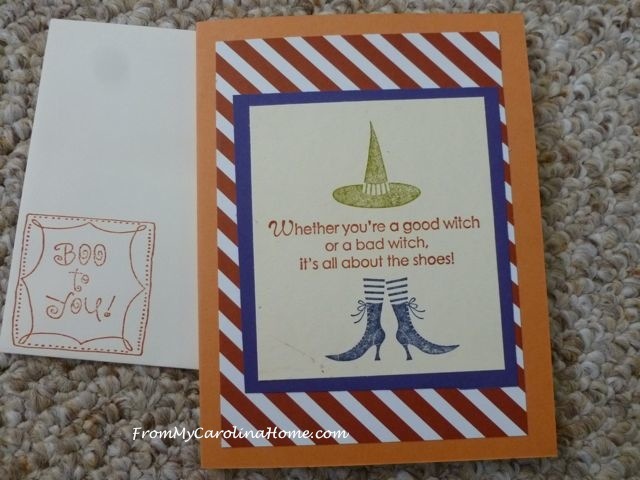 The witches hat and shoes are from one stamp set, while the sentiment is from another one with shoes. The giveaway today is from my personal stash of brand new, never used stamps. I bought a box lot of them from a friend, and had some duplicates as she is a dealer. This set has the ‘EEK’ stamp, so I thought it would be fun for the giveaway. It also has six more stamps suitable for other holidays, plus you’ll receive the flower stamp set with birthday and than you sentiments. I’ll ship these anywhere in the world, so international entries are welcome!! Rafflecopter EEK! 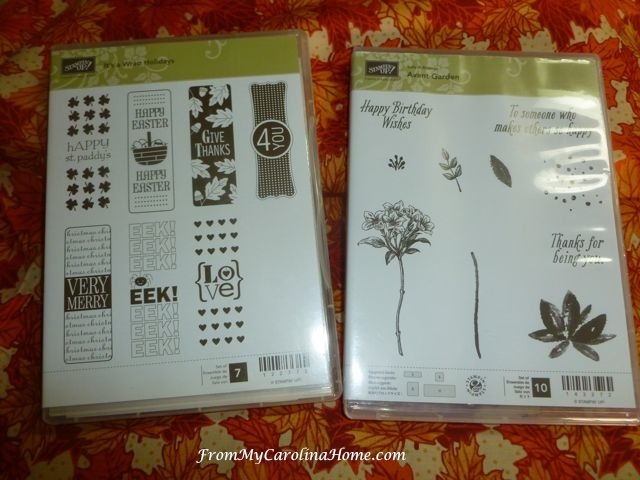 Stamp Sets Giveaway Click Here!! 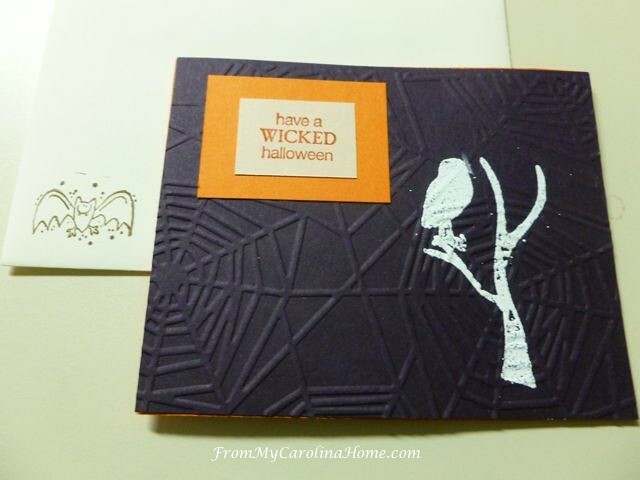 Are you stamping cards for Halloween? Such adorable cards, love watching you be creative. Happy Haunting! Love love ! Fall is a favorite season of mine! No Halloween stamping for me this year, we are on our month long Beach trip. Gonna be going to some craft shows the end of the month & hoping to find some xmas gifts! Really fun cards. 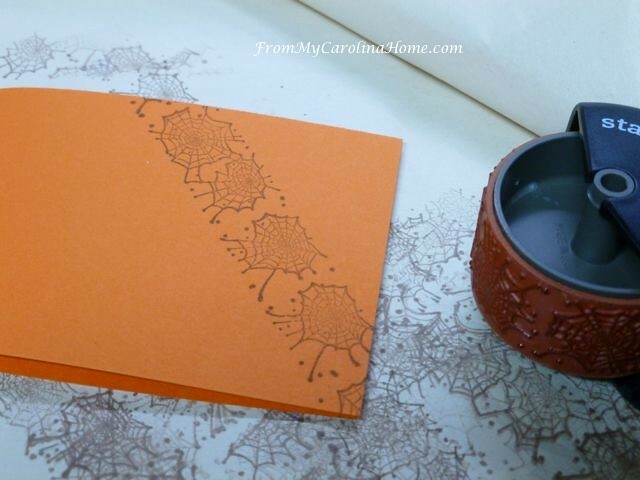 The roller and the embossing folder make great backgrounds! I really like how you can see the background through your ghost! Very effective for that image! I do make some Halloween cards, but some years I send out a lot a nd some years I just make a few. Have a great day! I so enjoy your blog. Always fun of fun ideas. All so festive! 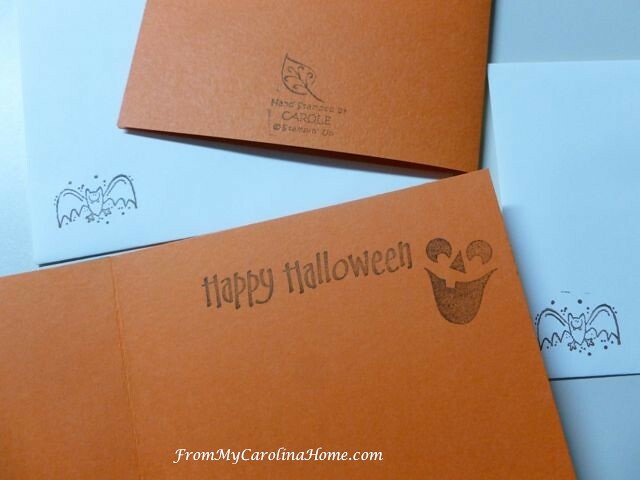 ‘Love the inside jack-o-lantern and the envelope bat stamp. I love seeing all your fresh ideas. Winning this set would start me on my way to joining the fun! Thanks for sharing. Carole all of your cards are BOOteaful! Have a happy hauntingfull Halloween. I love seeing how you make your cards. I will make some fabric Halloween postcards this year. Haven’t done much stamping yet. 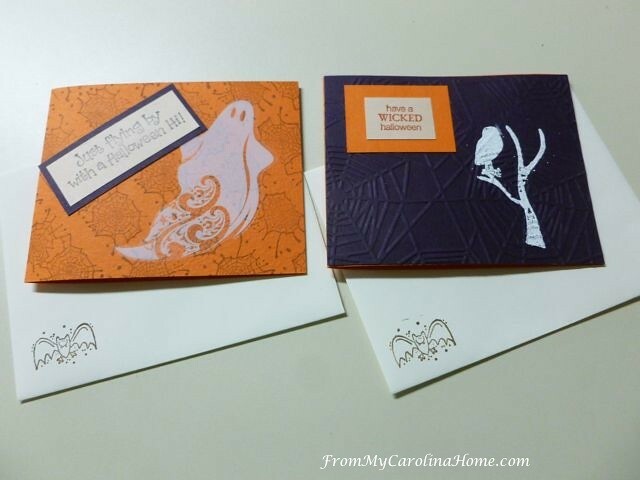 “Boo-tiful” cards and so creative! LOVE the cards and all the great products. 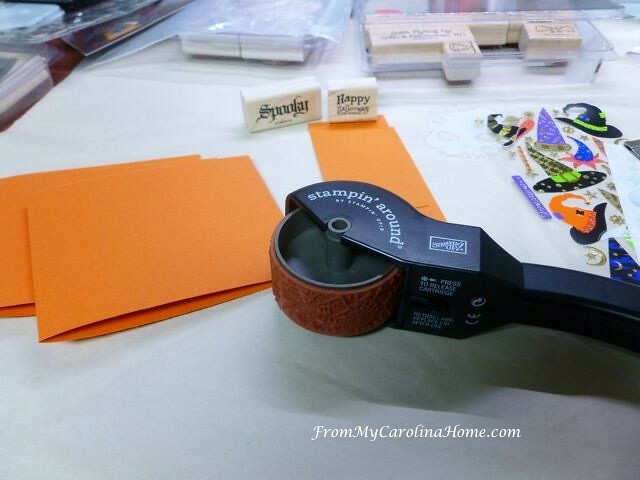 I could get into so much trouble if I had a Stampin’ up dealer nearby….ssshhhh…..I know one, don’t tell the hubby! Great cards and I can always count on you to remind me to get busy with my own ! Your cards always inspire me! You are just so creative, I love the wide variety of subjects you post about. I am interested in more than just one subject too. I enjoy reading your card making posts! I, too, like to hand make cards and Halloween might be my favorite holiday. Be sure your browser isn’t blocking opening a new window. Copy and past this link into your browser if you still have problems getting to the rafflecoper. https://www.rafflecopter.com/rafl/display/eba4574110/? Hello Carole! It is always such a pleasant “adventure” to watch as your cards unveil from start to finish! Your Halloween creations this year are great and who ever receives them will be feeling extra special! Thank you for sharing. Another fantastic give away from you! I am not going to enter though, as to the fact that I do not make any cards by stamping or any of the other fun items that you do. I hope that someone who will really use them and enjoy them will win them! Have a great day! I’m only doing one Halloween card this year, but plan on doong all my Thanksgiving cards!! These are just adorable, Carole! Thank for sharing at Vintage Charm! I enjoyed seeing your cards-in-progress. We have 5 grands that I make cards for plus numerous friends and relatives; it is often easier to make a bunch of similar ones as it is more time effective. We also do card making at Sunday school with a variety of age ranges and abilities (some developmentally disabled) using stamps, ribbons, stickers and imagination; and the kids love doing it–even if they are a bit heavy handed with the glitter! Very cute cards! I always love seeing your new creations. I have never done Halloween cards but have some stamps that I like to use for thank you cards or to decorate envelopes and such. Your cards are always over the top gorgeous! Love your cards. I think I would do more if I set up a “dedicated work station” for card making. I end up all over my sewing room, cutting paper on my cutting table; stamps on top of the sewing machine table, the desk is full of baskets with fabric for quilting project. I have started to acquire a few more stamps. 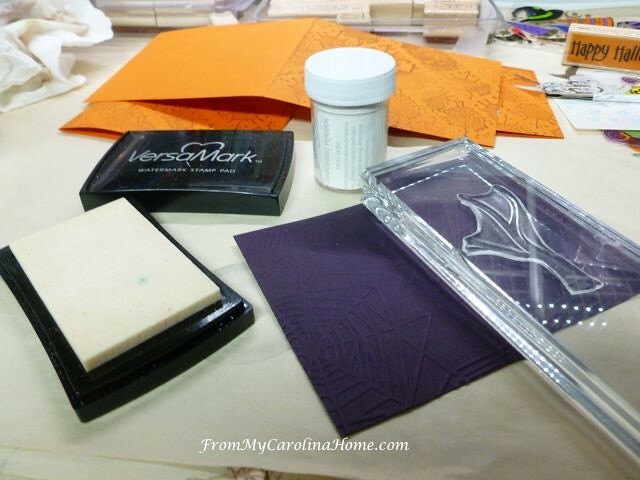 Can you buy the versa mark & embossing powder at AC Moore or Micheals? Or is it a specialty item from a stamping company? Super cute! We have a four day weekend and lots of crafts planned! Yes, my daughter and I will be stamping cards for Halloween!